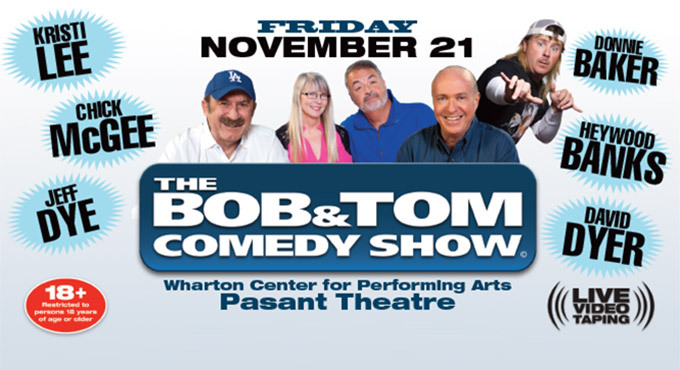 EAST LANSING — The Bob and Tom Show will be taping live at the Wharton Center for the Performing Arts Pasant Theatre on the campus of Michigan State University at 6:30 and 9:30 p.m. on Nov. 21. The adults 18- and- over- only show will be recorded live. Tickets for the event are $35 and will go on sale at 10 a.m. on Oct. 10. This is the first time the whole Morning Show will come to East Lansing and they are bringing some great comedians along for the show. Bob, Tom, Chick, Kristi along with comedians Jeff Dye, Dave Dyer, Heywood Banks and Donnie Baker will invade East Lansing on the campus of Michigan State University. The comedy show will be filmed and/or recorded for subsequent broadcasts. As an audience member, you may appear or be heard in these subsequent broadcasts. By attending this show you (and on behalf of any minor accompanying you) acknowledge that your voice, image, likeness, actions or statements may be recorded, broadcast or both and that you grant irrevocable permission to Roadwork Productions, Inc. and any other entities related to The Bob & Tom Show to use your voice, image, likeness, actions or statements in any media for any purpose whatsoever, including commercial purposes, without further compensation or consent.